See Video on You Tube Eliminates the use of chemicals, provides flexibility, accurate desuckering, increases productivity & reduces manual labor. The perfect substitute for heavy, hydraulic and expensive suckering machinery. Easy to use: no formal training required. • For specifications, see on-line catalog. See Video on You Tube For single or double “guyot” (cane) training. 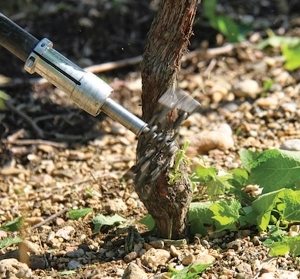 Soft steel wire strong enough to hold until harvesting but which degrades and falls away after a year at pruning time. 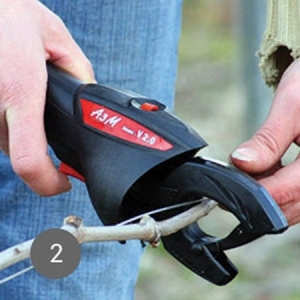 Machine grabs, twists and cuts the wire around the vine or branch you want to trellis. 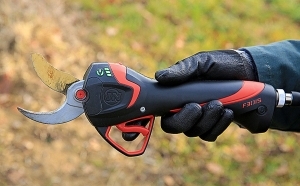 The most powerful electric pruning shear in the field: the world’s only pruning shear featuring 4 interchangeable heads and electronic safety system. Cuts are clean, avoiding the risk of disease, and the operator can easily and accurately adjust cuts while maintaining a comfortable hold on the tool. See Video on You Tube Elliptic System patented by INFACO SAS uses an “oval” head. The elliptical motion allows a faster and healthier harvest to reduce stress for the plant, even on high density and hard-to-reach areas. The olives fall nearby the user rather than being thrown around.